Hit your target quickly and quietly with the Gamo Raptor Whisper air rifle. This break barrel is loaded with features that make hunting, target shooting and plinking an absolute blast! You'll love how quiet the Whisper Technology makes this gun, and you'll appreciate the reduced recoil thanks to the Shock Wave Absorber (SWA) recoil pad. The single-shot Raptor Whisper delivers all-weather durability at crazy fast speeds of up to 1300 fps in .177 caliber and 975 fps in .22 cal. A great choice for small game hunting, target shooting and dispatching pests, the whisper-quiet shooting won't spook your quarry and will keep you in the game! The Raptor Whisper incorporates Inert Gas Technology (IGT) into the powerplant by using an inert gas cylinder versus a conventional spring. That means you get smoother cocking and shooting, no spring torque, no spring fatigue, no issues shooting in cold weather, and a much longer life than a spring provides. Things I liked: The price is right. I like the trigger pull the most. I have been shooting centerfires for a long time and it is a great starter gun for someone who hasn't shot a pellet gun in over 50 years. Sighted it in, in the morning and disposed of several pests in the late afternoon. I also liked the look on the other people's faces at the range, trying to figure out what I was doing. Things I would have changed: The safety is not what I'm used to. I would prefer a wood stock. What others should know: I think for the price if you have little critters to eliminate and you don't want to spend a lot of $$$$, this rifle is a good one for you. . 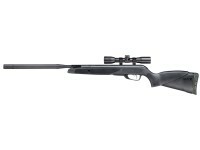 I have about 15 airguns and I just might add this one to my collection. Shoot at least 100 shots before you even try to evaluate what you have. LOTS of smoke from oil from the first 25 - 30 shots. Clean the barrel a couple of times before you sight it in. It will surprise you if you do. I would tell anyone to buy this rifle at this point with my experience. The triggers are different. The Raptor has the SAT trigger while the Wildcat has the standard Gamo trigger. The SAT trigger is much better.